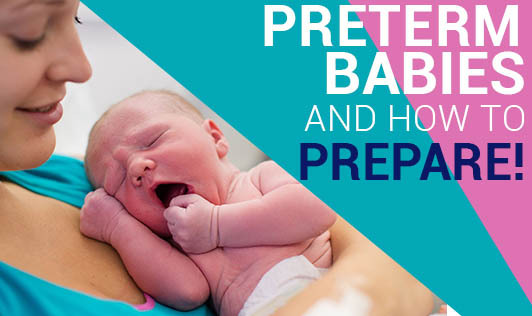 PRETERM BABIES AND HOW TO PREPARE! Labor beginning between 20 and 37 weeks is a "preterm labor/ premature labor". • The placenta separating early from the uterus; also called placenta abruptio. • Twins or triplet pregnancy. • An infection in the mother's uterus that leads to the start of labor. • Drug or alcohol use during pregnancy (quantity allowed is still under discussion). • Amniotic fluid/water loss before the start of labor. Every pregnant woman should know the symptoms of labor. Here are the common signs of preterm labor. • Contractions more than four or five per hour. • Regular contractions that increase in frequency. • Rhythmic or persistent pelvic pressure. • Cramps, similar to that during menstruation. • A change in vaginal discharge. • Uneasy or urgent sense that something is wrong. • A pre term baby will be prone to developing infections. • Their skin will be very thin and underdeveloped, with very less fat under the skin, so they quickly lose heat and are difficult to keep warm. • They are at-risk of developing respiratory distress syndrome. • The stomach will still be under developed to accept milk immediately. • Expect a delay in suckling reflexes. • Like a full term baby, they might develop infantile jaundice. However, severe or long standing jaundice can be fatal.